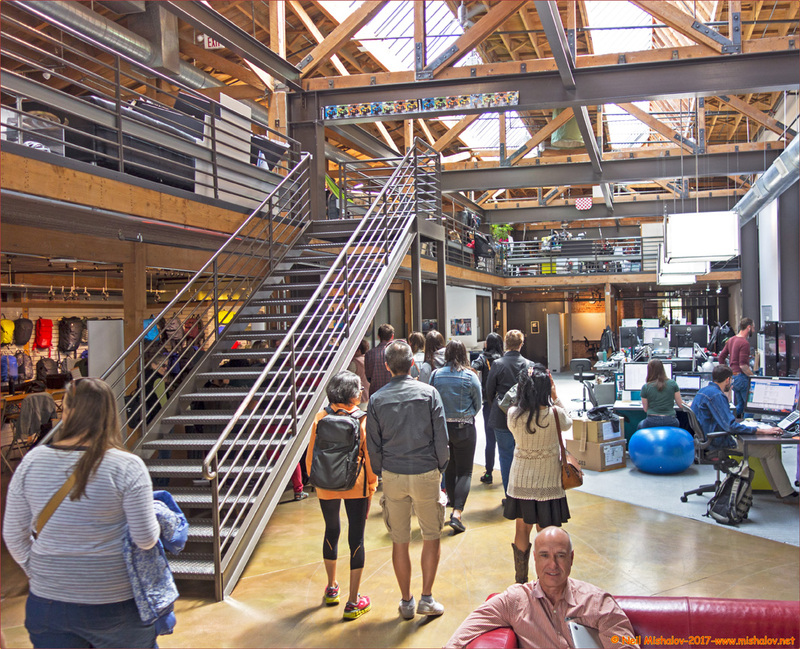 I had an appointment to view the Timbuk2 messenger bag manufacturing facility located in the Mission District of San Francisco. 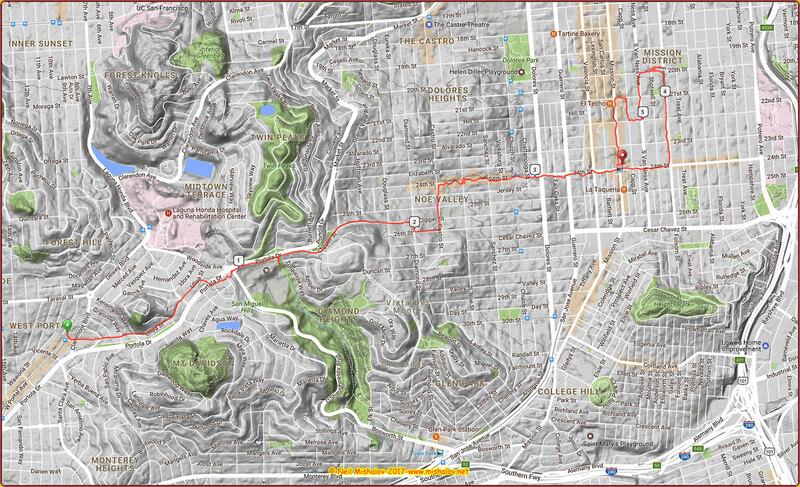 I started the walk to Timbuk2 at West Portal and walked through Diamond Heights, Noe Valley, and the Mission District before arriving at the Timbuk2 factory for an informative one hour tour. Yes! 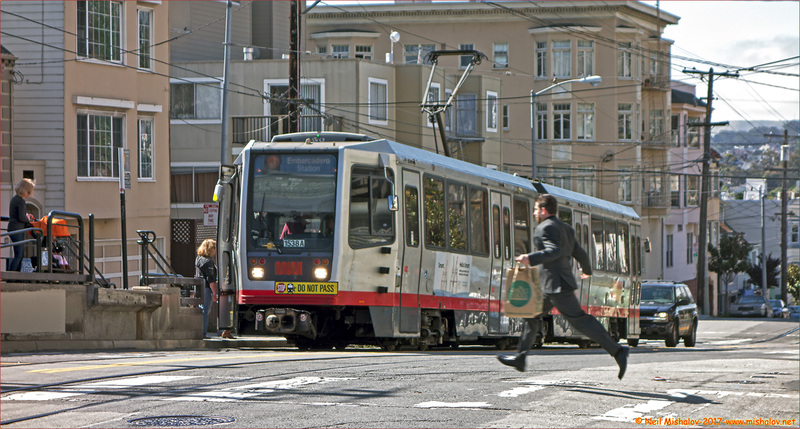 The fast moving runner was able to board the J-Church Muni Metro light rail streetcar; its final destination is downtown San Francisco. This location is at the intersection of Church Street and Twenty-fourth Street. Click on the image to see the full-size photograph. Here is a partial view of Glen Canyon Park as seen from the top of the ravine. John McLaren Park is visible in the distance; the view is looking south. Click on the image to see the full-size photo. 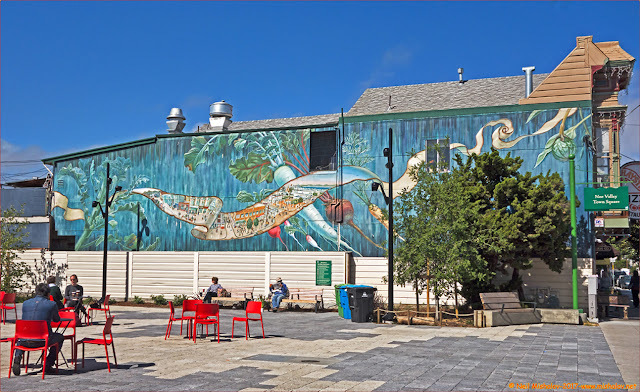 This is a view of the newly completed Noe Valley Town Square. Click on the image to see the full-size photograph. Here is a view of San Francisco Landmark #234. 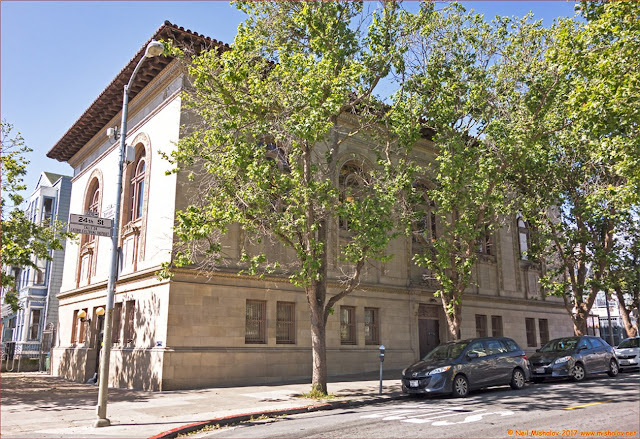 This is the Mission District Branch Library which is located at the southwest corner of Bartlett Street and Twenty-fourth Street. The library was opened to the public in 1916. Andrew Carnegie paid for the cost of its construction. Thank you, Andrew Carnegie! Click on the image to see the full-size photo. 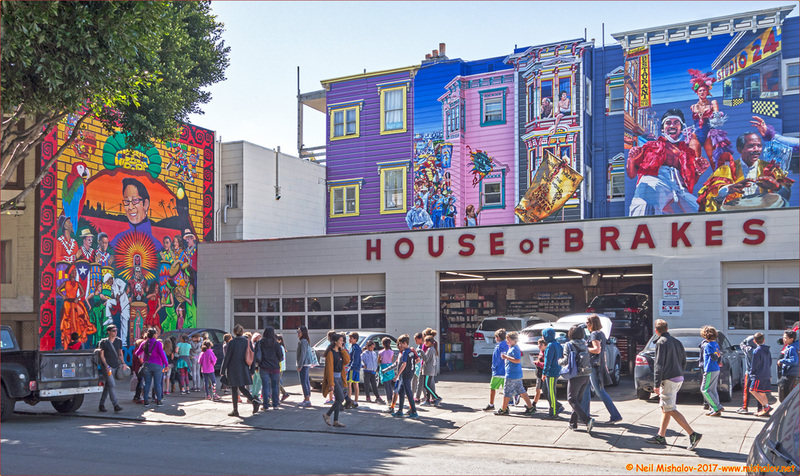 The street art surrounding the House of Brakes on Twenty-fourth Street has been updated, and it looks amazing. Click on the image to see the full-size photograph. 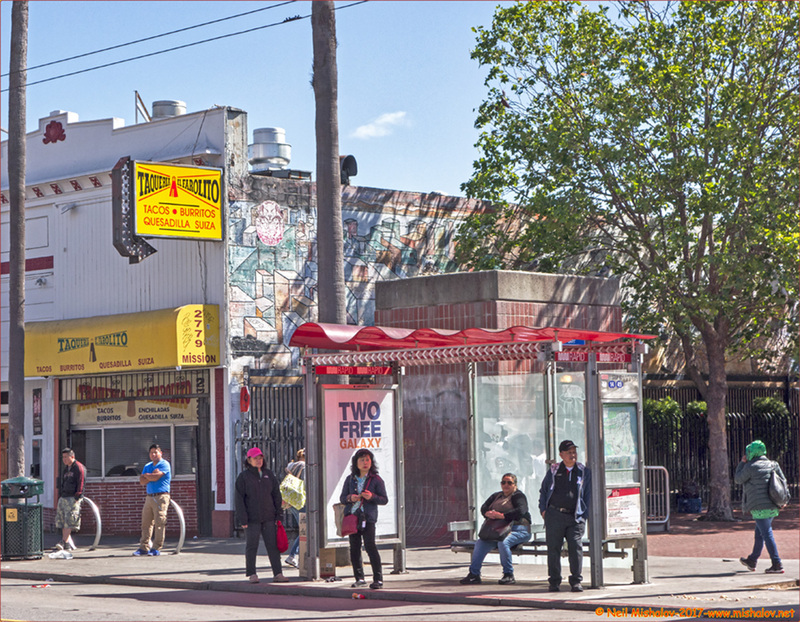 A view of a MUNI bus stop, a small above-ground section of the 24th Street Mission BART station, and Taqueria El Farolito. The location is Mission Street at Twenty-fourth Street. Click on the image to see the full-size photo. This building has had an interesting history. It was built in the early 1900s, before the 1906 earthquake. 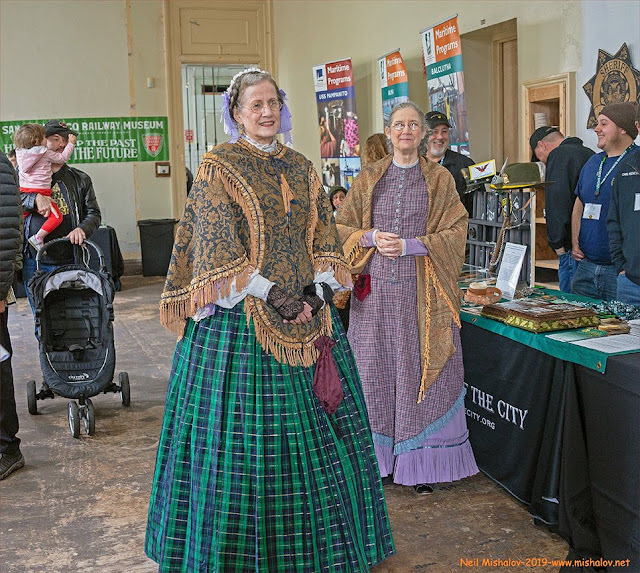 It was originally St. Johannes' German Evangelical Lutheran Mission. 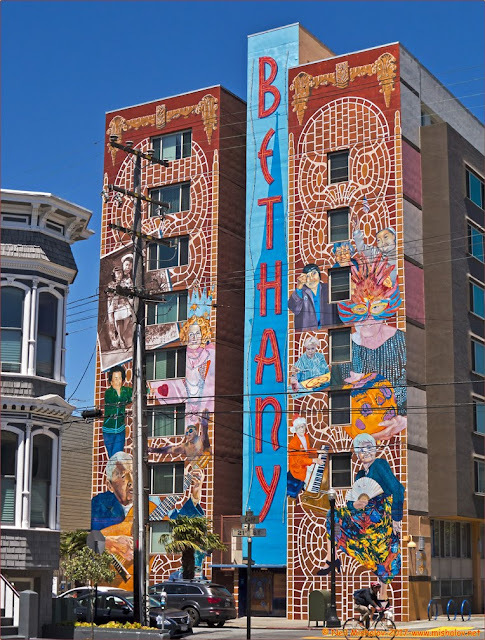 The building, located on Twenty-second Street near Capp Street, was just out of reach of the 1906 fire that destroyed a large portion of the Mission District. In 1992 the congregation moved to a smaller building around the corner. This building then became a private residence. The plan was to divide the building into condominiums. 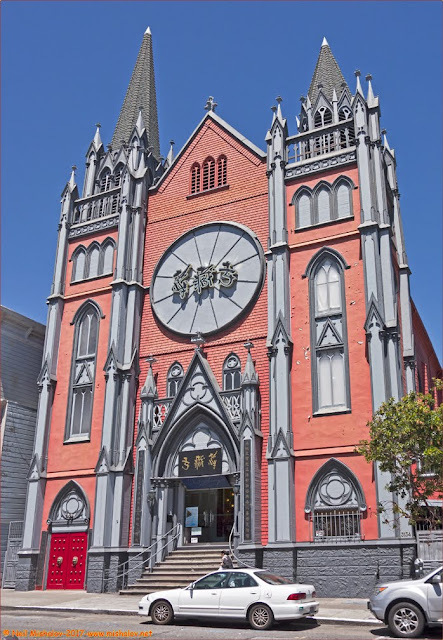 At the last moment, the United International World Buddhism Association purchased the building for $2.5 million in 2002. It is now the Hua Zang Si temple. Click on the image to see the full-size photograph. I joined about twenty people on a tour of the Timbuk2 headquarters building and factory. Timbuk2 is a San Francisco original, it was founded in 1989 by a bike messenger in a garage in the Mission District; not far from its current location. Since its inception, Timbuk2 has designed quality bags and packs. Click on the image to see the full-size photo. This is the Bethany Center Senior Housing building. It is located in the Mission District on Capp Street at Twenty-first Street. Click on the image to see the full-size photograph. The distance traveled was approximately 5.7 miles (9.2 kilometers). 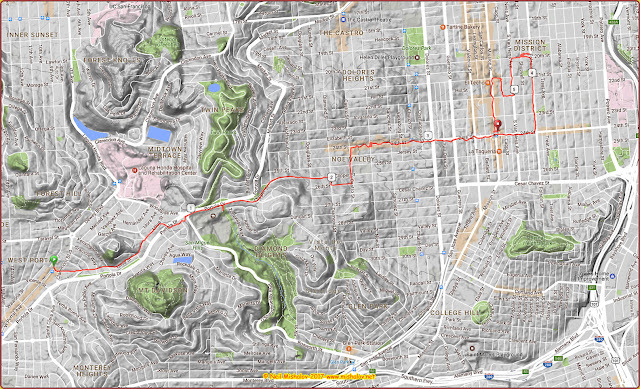 The cumulative elevation gain was about 318 feet (97 meters). Mile markers are displayed on the GPS generated track. Click on the image to see the full-size map. A Sony RX100 camera was used to take these photographs.